Their second daughter, Catherine (15) stayed behind with an aunt and an uncle on the Isle of Man. (See Genealogical Charts 1 and 4 - 8). 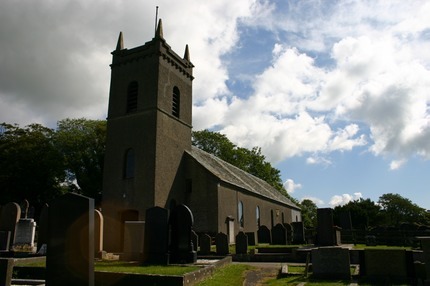 James, birthplace Arbory, Rushen Vale, in the southern end of the Isle of Man, was the son of William and Catherine (nee Moore) Qualtrough and he had three sisters - Elizabeth, Margaret and Jane. 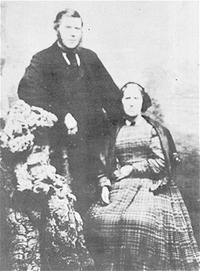 ames and Catherine (CLAGUE) QUALTROUGH before they left with their family for New Zealand in 1859. Margaret's son, Edward, married Christian Moore and they produced three daughters named Kathleen, Irene and Marjorie. Marjorie married Herbert Pedder. (See Genealogical Chart 1). The names sound formal, copied from documents. The owners were almost certainly called Jim or Jamie, Kitty or Kate among family and friends, for in James's shipboard diary, as you will see, the children are referred to by the diminutives of their given names. It must have taken courage, faith, optimism - and surely a degree of desperation - for a middle-aged couple with eight children to pull up stakes from a settled land and sail to an unknown country on the other side of the world and start all over again. 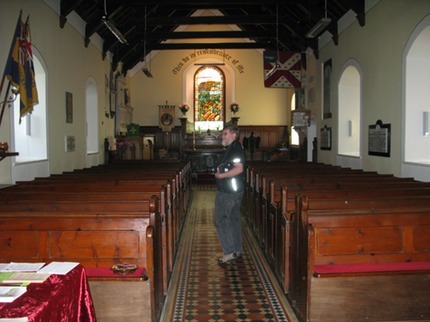 The Isle of Man was a rural community with little employment for young people other than to work the land. Farms had been supporting families for generations and had been divided and subdivided. Most holdings were small, most families were big. What could the future promise? In New Zealand the Government was enticing the "right" kind of settlers - good, experienced farming folk of some substance - with what was popularly called the "40 acre scheme." (Officially the Auckland Wastelands Act of 1858.) To emigrants who could pay their own passage out the Crown would grant land - allotting 40 acres per adult and 20 acres per child above five years of age and under 19 years of age. James must have been struggling for some time before the decision to emigrate. It seems he had inherited debts from both his father and father-in-law and was obliged to meet them. The decision was made. Most of the land that was James's, comprising three farms,one in the north and two in the south of Man were disposed of, belongings were packed. It was good-bye forever to mystic Mannin Beg - Isle of Fairies - where Qualtroughs had lived for hundreds of years. Towards the end of June (1859) James and Kitty and the family turned their backs on their Island homeland and their past and crossed to England to make ready for the long voyage to the new land. How their thoughts must have been with Catherine who stayed behind. The tears must have flowed at the moment of parting; the hearts ached. They made for Liverpool where their ship awaited them. It was the Mermaid, already famous for a race against the illustrious Red Jacket in 1854 on the competitive London-Melbourne run. Mermaid had lost upon that occasion but nevertheless she was the pride of the White Star line, a clipper of 1321 tons built in Nova Scotia in 1853 and destined 50 years later to be wrecked off Southport on passage from Liverpool to Quebec. She was making her first – and only – voyage to Auckland. Thereafter she was to serve the London-Lyttelton run under the Shaw Savill flag (by charter until 1869 when she was purchased) and to make waves in nautical circles with a record voyage of a mere 75 days from Lyttelton to the English Channel (unloading on the 78th) in 1862. Such a feat was this that Mermaid was accorded a heroine's welcome when she sailed into Lyttelton in February 1864. The then LYTTELTON TIMES reported that other ships in port flew bunting and fired a salute to her master, Captain Rose. The first sight of the ship, black-painted hull a foil for the pine-yellow topmasts and furled white cotton sails must have imprinted itself on the minds of the young Qualtroughs. "The figurehead, carved by a craftsman of rare skill, was the most lovely mermaid ever chiselled. Her long, blue-back hair, as sleek as a seal's coat, fell and flowed as to the life and in keeping with tradition, she held a comb and a glass in her hand. The siren advanced, bowing with the rythmic progress of the ship, ushering the sea rover into the realms of blue water. The swell sometimes buried her generous bosom as the bow fell into the hollow and the next heave upward, lifted her on to the crest and bared her graceful dolphin tail." "Looking outward one would have seen that the vessel had a broad yellow band along her covering-board, defining her sea-kindly sheer and her high lift of bow. No make-believe lines of painted gun-ports chequered her sides. That fashion of 13 dummy ports aside was left to the British ships…… double top-sails had just come in to the Merchant Service but so far the Mermaid's owners preferred the old-style whole ships." Mermaid's master was a Captain White and he was taking some 400 passengers of various classes out to a new life in a new colony-English, Irish, Scottish, German and, it goes without saying, Manx. It must have taken some planning on the Qualtroughs' part. Imagine the foodstuffs, clothing, medicines, toiletries, books and other domestic needs for the long voyage for 10 souls plus such household effects that could be taken on a ship which were considered essential. On July 11 the Mermaid was towed down the Mersey River towards the open sea. On July 15 she spread her three columns of canvas, the proud and serene figurehead rejoicing in the tang of the Irish Sea which the Manx family were never again to sail upon - save the eldest son James Jnr. 22 years later following his father's demise -and it was southward ho! James Snr was a tall, good-looking man, educated, courteous, religious and with a dry sense of humour. This we deduce from a photograph taken of him and Catherine before their departure, and from the writings in his diary and descriptions to James Cowan by his mother, Elizabeth Jane (also called Betsy). Jimmy Cowan was about 11 years old when his grandfather Qualtrough died so he would have had some personal memories himself. The version of James Qualtrough's diary following on here is one of the copies scattered throughout our family. The original was held by the late Mr. J.A. (Bert) Kinley, of Ballafesson, Isle of Man, a descendant of daughter Catherine. We only wish that James had continued to keep such a diary of his life in New Zealand. Catherine, in the photograph above, looks neat, well-dressed and slightly formidable, much less a relaxed person than her husband. But who is to say? Perhaps she just took a poor picture. And with a husband and seven children to look after (James Jnr and daughter Catherine living with relations) body and mind must have been on the go from morning to night. There were no labour-saving devices as we know them. Upon Kitty and 20-year-old Betsy must have fallen the bulk of the thousand-and-one details of preparing for the family's personal needs upon the high seas. According to entries in James' diary, Kitty was also active in helping sick and distressed fellow-passengers throughout the 100-day voyage. Most of all she kept her own dear ones alive and healthy from Mannin Beg to Aotearoa and throughout the years as early settlers. The voyage was lively. Tragedy, drama, comedy trod the deck of the ship as surely as ever they trod boards of theatre. Entries in James' diary set the springs of imagination a-bubbling.